Adaptive algorithms of multialternative sequential detection of target trajectory using the upper and lower thresholds and employing decision statistics of pips at the unknown signal-to-noise ratio (SNR) have been derived on the basis of the sequential criterion of simple complement. The application of lower thresholds made it possible to implement the procedure of discarding unsuccessful hypotheses. An adaptive two-alternative sequential algorithm of target track detection was developed using decision statistics of pips with SNR estimation by the criterion of error mean square minimum. The statistical simulation was used to analyze the algorithms for the case of target track detection on the basis of data of the surveillance radar that measures the range and radial velocity of target. VAN KEUK, G. Sequential track extraction. IEEE Trans. Aerosp. Electron. Syst., Oct. 1998, v.34, n.4, p.1135-1148, DOI: http://dx.doi.org/10.1109/7.722699. NEUIMIN, O.S. ; ZHUK, S.Y. 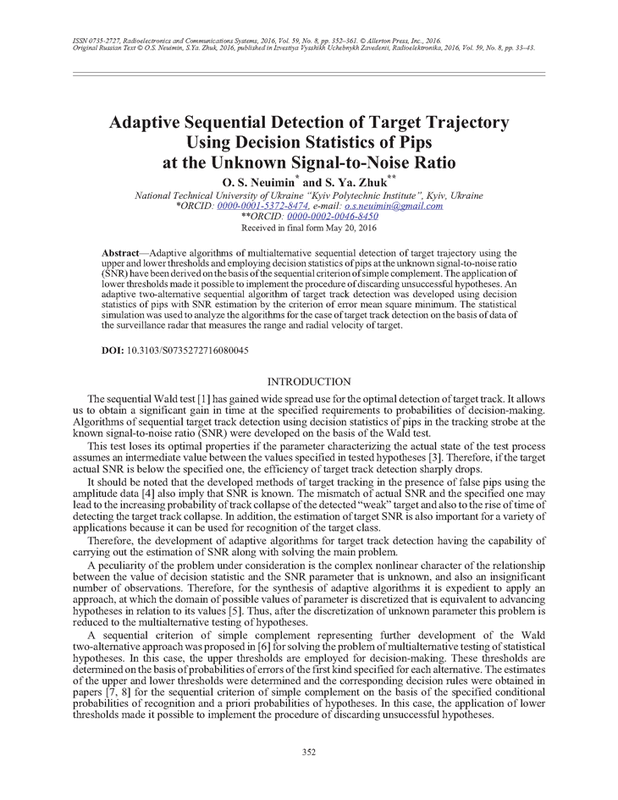 Sequential detection of target trajectory using the decision statistics of pips. Radioelectron. Commun. Syst., 2014, v.57, n.6, p.262-273, DOI: http://dx.doi.org/10.3103/S0735272714060041. AKIMOV, P.S. ; BAKUT, P.A. ; BOGDANOVICH, V.A. ; ET AL. Signal Detection Theory. Moscow: Radio i Svyaz’, 1984 [in Russian, ed. by P. A. Bakut]. EHRMAN, L.M. ; BLAIR, W. DALE. Probabilistic data association with amplitude information versus the strongest neighbor filter. Proc. of IEEE Aerospace Conf., 3-10 Mar. 2007, Big Sky, MT. IEEE, 2007, p.1-6, DOI: http://dx.doi.org/10.1109/AERO.2007.353040. STRATONOVICH, R.L. Principles of Adaptive Reception. Moscow: Sov. Radio, 1973 [in Russian]. VASIL’EV, V.I. Recognition Systems. Reference Book. Kyiv: Naukova Dumka, 1983 [in Russian]. ZHUK, S.Y. ; KOVALEV, V.I. Multialternative sequential decision rule with discarding of unsuccessful hypotheses. Problemy Upravleniya i Informatiki, 2000, n.4, p.88-96. ZHUK, S.Y. ; KOVALEV, V.I. Joint filtering of the state and recognition of the structure type of dynamic system with discarding of unsuccessful hypotheses. Radioelectron. Commun. Syst., 2001, v.44, n.7, p.12-20. TRIFONOV, A.P. ; SHINAKOV, Y.S. Joint Discrimination of Signals and Estimation of their Parameters against the Background of Interferences. Moscow: Radio i Svyaz’, 1986 [in Russian].